Learn to play at your own speed with this wireless, compact smart guitar. A traditional guitar neck with strings and frets plays through your iPhone, iPad, or Mac, while free downloadable lessons provide instant instruction and evaluation. Learn the basics or tweak your technique. You can even create your own music through MIDI apps, like Garage Band. Learn to play the guitar at your own pace, anywhere. Jamstik+ is a second generation, wireless MIDI guitar that pairs a traditional guitar neck—with frets and strings—with downloadable lessons. 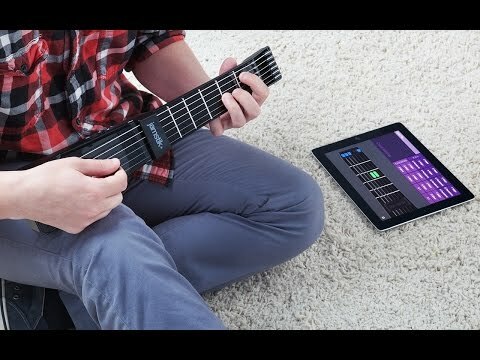 A library of free apps teaches you techniques that translate to a regular guitar. 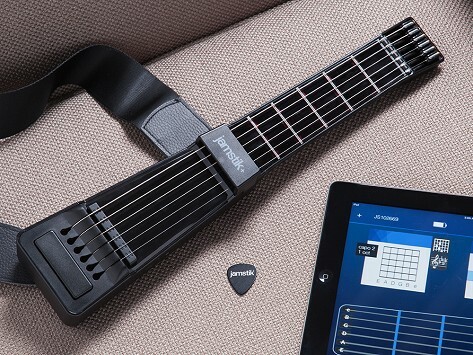 Jamstik+ plays through your iPad, iPhone, or Mac—which is where the sound comes from. A new feature, magnetic pick up, creates a better connection between the pick and the metal strings to deliver instant feedback through the interactive tutorials. Bluetooth connectivity has also been added. Founder Daniel Sullivan has been innovating at the intersection of tech and creativity for years, and his mission with Jamstik+ was to join music and mobile devices to teach guitar. Compact and easy to transport, Jamstik+ helps you learn at your own speed, wherever you are. Before you know it, you’ll be a guitar hero.